Ben Brizzi was born with a congenital lower limb difference which resulted in an amputation when he was toddler. Now in his early 40s, Ben has seen significant changes in technology and support for people with limb differences over that time. Ben’s limb difference has never held him back from pursuing sports, volunteering in the community, entering into a professional career in telecommunications and being a passionate advocate for children with limb differences. Ben was born and raised in Melbourne, in Preston to be precise, and has lived in that suburb his whole life. Ben has an identical twin brother, who wasn’t born with congenital limb differences, and grew up in a family with an Italian father and Australian mother. In addition, Ben has an older brother and younger sister. Ben was born in 1972 with an unformed tibia and heel bone, a condition which resulted in his right lower leg amputated when he was 14 months old. “I consider the impacts of my leg amputation to be quite small and, as I don’t remember that time in my life, my family say that I really ‘took off’ in terms of walking after I had the surgery,” said Ben. Ben has witnessed significant changes in prosthetic technology between when he was a child and what is available today. “When I was young my prosthetic leg was an old style where chords, cased in plastic, allowed the leg to move and leather was strapped from my waist and then around my right thigh to keep the leg in place,” explained Ben. “While my original prosthetic leg, compared to what child and adult amputees are fitted with today, might have seemed very cumbersome I don’t remember complaining. It was just the way it was and it was part of me! I could run, walk and play and I never felt that I was missing out on anything; something that was very beneficial growing up as a twin in a competitive environment!” stated Ben. In comparing the prosthetic leg he used as a child with the one he now uses, Ben said “the changes are so remarkable and different, it really does blow you away”. Ben now uses a Total Surface Bearing (TSB) socket and Freedom Foot, which he finds comfortable for both general and active mobility, and also recalls being “so excited when the rubber foot casts were first moulding ‘veins’ on the prosthetic foot”. Although Ben was aware that his prosthesis meant he was a little slower than others when he was a child, it never stopped him from trying sports. “From the age of five I competed in Little Athletics in summer and football in the winter, and I was also introduced to the now defunct Amputee Athletics Victoria after my Dad spoke to an older amputee,” recalled Ben. Competing in the Australian Amputee Championships at the age of eleven, Ben won two gold medals (200 metres and 400 meters) and two silver medals (100 meters and long jump) and was “stoked by receiving the really heavy medals”. Ben feels that having a limb difference hasn’t really held him back from anything, that he’s had great life experiences and has a great support network of family, friends and colleagues. “The only I thing I couldn’t do, and still can’t, is long distance running. I found that running more than 800 metres would result in blisters on my stump and, while I tried stockings and ointments, lengthy runs just weren’t for me. Instead it allowed me to focus on other sports and shorter distance competitive running, so it really wasn’t a problem,” shared Ben. Ben was born into a family with strong connections to the sport of boxing. “In 1968 my father and uncle established the ‘Brizzi Bros Boxing Gym’ in Melbourne and have had some great success training amateur and professional boxers over the years. So naturally, my twin brother and I learned how to box. We participated in some amateur bouts but due to having enlarged spleens we couldn’t continue,” said Ben. 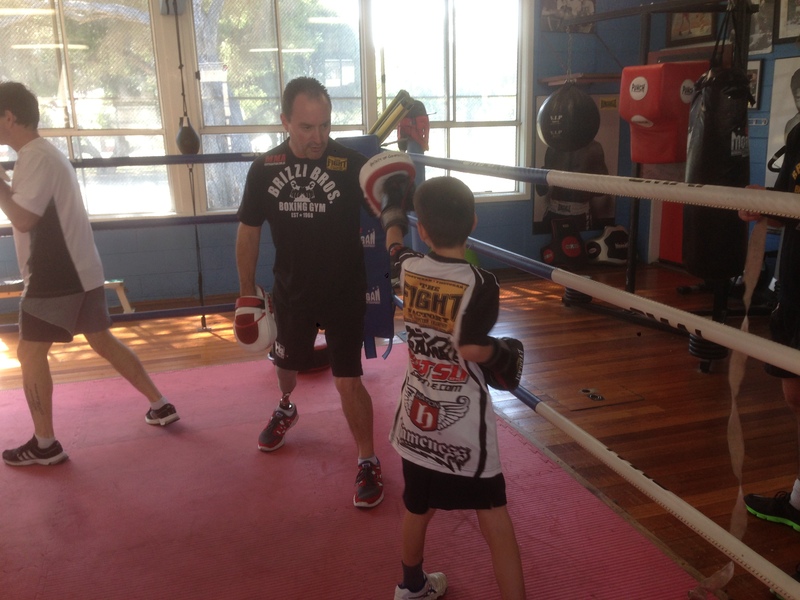 While Ben concedes he is biased he does believe that his Dad is one of the best boxing trainers in Australia; something backed up by the fact that their family gym has been successfully operating for almost 50 years. Ben is now a part-time boxing trainer himself, and feels lucky to have been able to learn under his Dad’s guidance and develop “great coaching methods and techniques”. Indeed Ben recommends boxing as a good fitness sport that can cater to individual needs and abilities. “Boxing can accommodate people regardless of whether they are sitting or standing, and I’ve trained people who use wheelchairs. At the end of the day the most important thing is that the person is comfortable, confident and hopefully exhilarated after a session,” Ben explained. In thinking about his family, and the support he has had from them throughout his life, “they are awesome” is the way Ben sums them up. “Even though I had a limb difference, and a twin brother as a point of comparison, I was never treated any differently apart from the obvious times where I may have needed help. I was never talked about or spoken to any differently by immediate or extended family members. My leg was just part of who I, Ben Junior, was,” recounted Ben. Ben concedes that things did get a little bit harder for him as he entered adolescence; a time when he felt more self-conscious about his limb difference. It was also the first time that other young people giggled or stared at his limb difference and consequently his “self-confidence took a bit of a hit”. Ben admits to getting into a “few scraps as a boy” but when taunts about his leg arose he used to think to himself “Is this the only angle they’ve got? They have to mention my leg to get a rise out of me?” “Once I thought of it that way I felt more confident and started to think it was them that had the problem and not me,” said Ben. As an adult Ben has had great support from his employer, the Victorian Telecommunications Ombudsman. Getting older has seen Ben develop cysts in his stump from time to time, and has nothing but praise for the understanding that he has received from his workplace when this occurs. “My colleagues and the Human Resources Department always check if I am OK, ask if there is anything they can do to assist and are quite comfortable with me taking my leg off anytime I need to,” said Ben. Ben often wears shorts, thus exposing his prosthetic leg, which naturally leads some people in the community to ask why he has a missing limb; a question that Ben is more than happy to respond to. “I usually say that when I was born I had no bone here, at which point I point to my shin, and then say I also didn’t have a bone here, and then point to my heel and ankle. Once I’ve pointed those differences out, I then tell the person that because of those conditions the doctor removed part of my leg so I could walk properly,” explained Ben. Ben feels it important to respond to questions about limb difference “so that people, who may never have met an amputee previously, learn about amputees in a positive and educative way”. Ben finds the growth in online and organisational support for amputees in recent years to be “absolutely phenomenal and important”. Support, exposure and the reduction in community stigma related to amputees are significant positive changes that Ben has witnessed increasing since his own childhood. “While there was some community support when I was a child, the growth of organisations like Limbs 4 Life and the Limbs 4 Kids program has increased support tenfold,” said Ben. Ben feels that the Limbs 4 Kids program “is great for providing a network for kids and families who can now reach out for any advice or help they may need; a support that is invaluable and can’t be measured”. Ben also feels that the increase in support organisations is also helping professionals working in the amputee field as “you can speak to your prosthetist or clinic and they can put you in touch with someone who can assist you in any way you need”. Ben recently undertook the inaugural Limbs 4 Kids ‘Parent Peer Support Volunteer’ training via webinar; training that is open to parents of children with limb differences or adults who, like Ben, grew up with a limb difference. 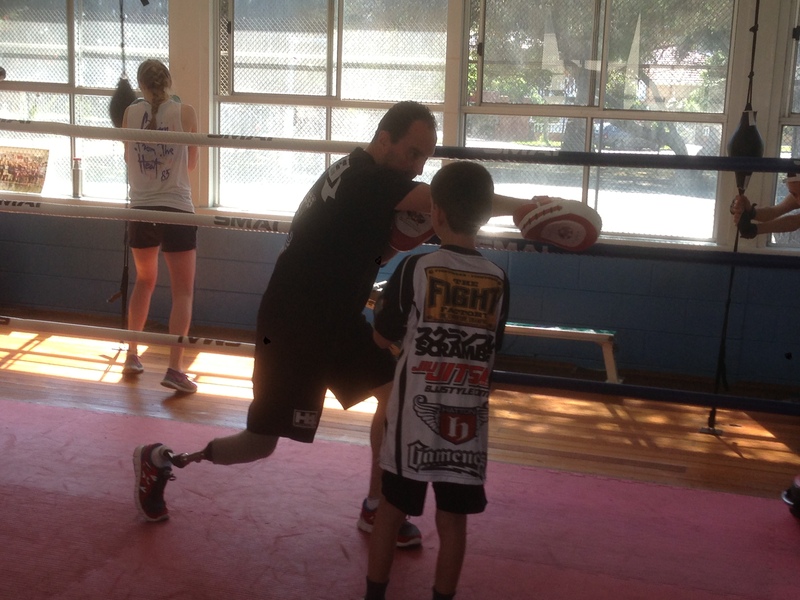 While Ben already volunteers his time to Boxing Victoria, Boxing Australia and Future Stars Cricket Academy he was keen to become a Limbs 4 Kids volunteer as he “wants to give something back, share his story with others and show people that having a limb difference can actually open up doors that you never thought were possible”. Ben recognises that everyone is different in some way, his just happens to be a leg difference. “I might not have part of my leg, but I really do believe that there are no limits to what people can achieve with the right support,” said Ben. “I also like to let people know that although I might wear a prosthesis I can dance like a demon,” laughed Ben. Limbs 4 Life would like to thank Ben for sharing his story in this edition of Thrive, as well as congratulate him on becoming a new Peer Support Volunteer with the organisation!